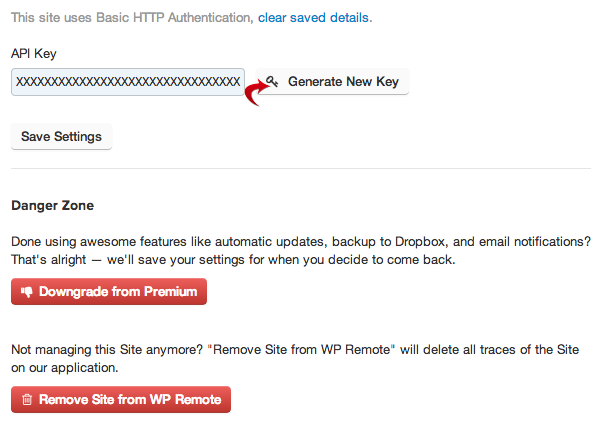 You can change or regenerate the API key for your site via the General Settings screen (from Settings button). Go the API key section and click on Generate New Key. In order to use your new key you will need to deactive and then reactive the WP Remote plugin. The API box will be shown when you reactive the plugin and you can re-enter the API key as shown on on the WP Remote site. The easiest way to make sure you get the correct API key is to open your site in another browser window and then copy and paste the API key from the WP Remote screen to the WP Remote plugin in your site. Download Site and Automatic Backups are different in size? I can’t remember my user name? I’m being asked for FTP information? My site is showing up as red? My site is showing up as yellow? The plugin is asking me for my API key?